Information and culture minisrer Lai Mohammed has warned that President Muhammadu Buhari’s administration is not to share money but to provide basic needs. He explained that the government was aware of complaints of no money by many Nigerian, but that the administration preferred to invest in infrastructure that would have ripple effects on the economy than sharing money to people and political stooges like the previous administration did. The administration, he said was committed to developing infrastructure that will uplift living standard of people. The minister stated this in Tatabu village near Mokwa in Niger state while inspecting the reconstructed and rehabilitated Ilorin-Jebba- Mokwa road project. The News Agency of Nigeria (NAN) report the 93.6 km road project, now completed, included the total reconstruction of Ilorin to Jebba axis and rehabilitation of failed portions from Jebba to Mokwa. NAN also reports that the Ilorin-Jebba road is part of the Lagos- Algiers road called trans Sahara roads which cuts across the West and North Africa. In Nigeria, the road connects the South-West geo-geographical zone to the Northern part of the country. “When people make this complaints, they easily forget that for 16 years, one political party was in power, sharing money, when this road became completely failed. “APC in three years, has fixed this road to this level. I think it speaks for itself. “Before now, it takes about five days for trucks to move from Ilorin to Jebba. Today, it takes only two hours. “Today, on this road, you can see free movement of goods and services which is the beginning of revival of the economy,” he said. The minister added: “We are not a government that will share money like what others did which put the country in a mess. “This government believed in investing in infrastructure because if you get this rightly, it will translate to wealth creation. “Let us take for instance, if this road contract costs N10 billion and we share it to political stooges in this area at N1 million each, we will only give 1,000 people and there will be no road. “At the long run, those that we share the money to will join in abusing the government of non-performance. “On our part, we will rather slowly and painstakingly revive our economy through infrastructural development and we have a lot of stories to tell on this”. Mohammed stressed that Nigerians should thank God that they have an administration that is focussed and investing in infrastructure. He said the government would not be distracted but remained focussed in the development of infrastructure to better the lives of the people. The minister recalled that the road project was awarded by the previous administration in 2013 and work was supposed to have commenced in 2014. He said when the Buhari administration came in to oower, the project was only 15 per cent completed. Asked, whether government would toll the road to raise money for its completion to Birnin-Gwari in Kaduna and for its dualisation, Mohammed said, not all road could be tolled. “This matter came up at the last Federal Executive Council meeting and we agreed that, not all roads could be tolled. “The idea of tolling roads is to recoup the expenses on the construction and make them sustainable. “A study is being compiled and at the end of it, it will be decided on what roads to toll and which not,” he said. 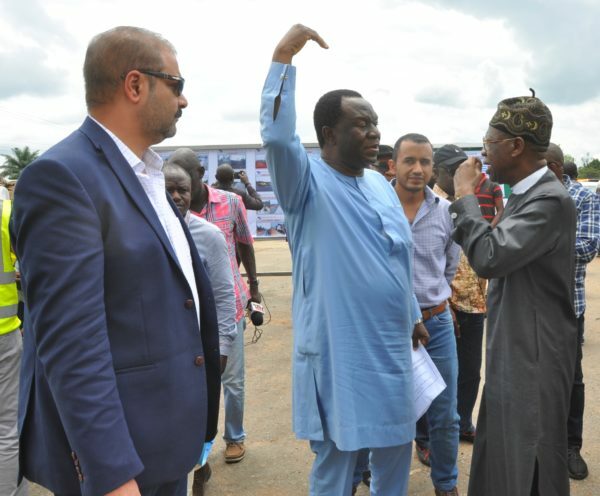 Earlier, Mr Atitebi Wasiu, who conducted the minister and his entourage on the inspection said the substantial part of the heavy traffic on the road were heavily loaded trucks due to the import and export of goods through Lagos port. Wasiu, the Federal Controller of Works, Kwara, said the average daily traffic for trucks only on the road was about 7500 while light vehicles accounted for about 7000. He said most of the vehicles abandoned the road before the rehabilitation took place. “The road which was constructed since over 30 years ago was abandoned by motorists for not less than 10 years due to its complete collapse. “Those trucks which had no alternative were spending 3-5 days to transit this 93,6km road from Ilorin to Jebba before the eventual intervention of the federal government,” he said. The Engineer said the quality of the project carried out by Messrs CGC Nig. Ltd is of international standard and the life span is 20 years. He also disclosed that the contract for the dualisation of the road had been awarded and work would commence in the next three weeks. “The dualisation is awarded to the same contractor from Ilorin-Jebba-Mokwa at the total contract sum of N130 billion.